One of Joburg’s most vibrant examples of inner city regeneration, the streets of Braamfontein are filled with impressive public art installations and a riot of colourful graffiti murals that can be spotted on almost any corner. 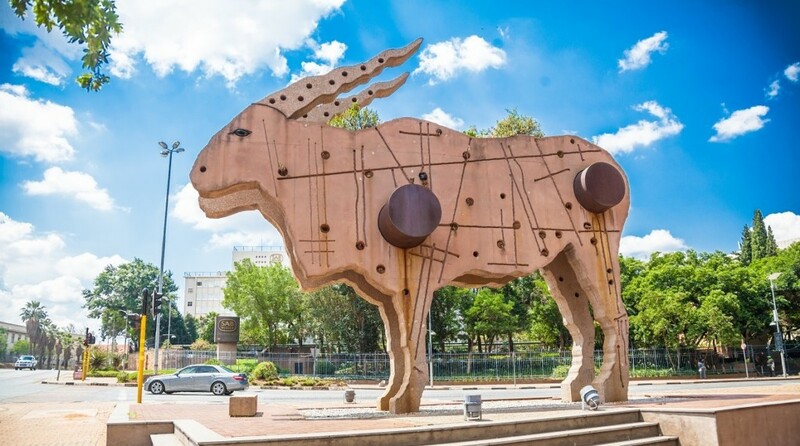 Here’s our guide to some of the most awesome public art installations to look out for in Braamfontein. American street artist Shepard Fairey (best known for the Hope posters created as part of Obama’s presidential campaign) painted this 200 metre high mural in 2014 in tribute to the 1989 Purple Rain protest. In 1989 peaceful anti-apartheid protesters came up against riot police armed with tear gas and batons in downtown Cape Town. The protesters were also attacked by a water cannon filled with purple paint, which the police hoped would help identify them later for arrest. The plan backfired however when the protesters took control of the cannon and used it to fire purple paint onto the police. In the following days graffiti tags spread across the city declaring ‘The Purple Shall Govern’, a pun on the opening phrase of the anti-apartheid movement’s Freedom Charter. 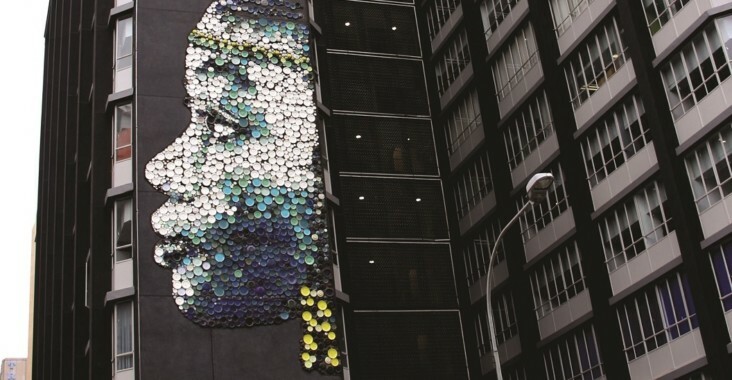 Unveiled in August 2018 Hannelie Cotezee’s Nzunza (pictured top) is a 10 storey mural on the side of a Braamfontein towerblock made from more than 2000 ceramic plates. The artwork is inspired by the history and culture of the Ndzundza (or Nzunza) Ndebele people who lived in what is now the Gauteng Province in the 17th Century, establishing communities that manufactured jewellery and pottery, long before the discovery of gold and the establishment of the city of Johannesburg. The ceramic plates themselves are rejects from the nearby Liebermann Pottery workshop while the adhesive company Tal produced approximately 2.6 tons of special charcoal adhesive to help secure them to the wall. Installed outside the Johannesburg City Chambers and the Civic Centre on Rissik Street in 1964, this bronze sculpture of three miners wielding a mine drill pays tribute to Joburg’s mining history. The monument is positioned so that the three miners face south west in the direction of the Langlaagte, where Joburg’s massive gold reef was discovered in 1886. Find at: the corner of Rissik and Joubert Streets. The alleyways that run parallel to De Korte and Juta Street, linking the cross streets of De Beer, Melle and Biccard, host a collection of public art works that have transformed these neglected and forgotten throughways into colourful corners of the neighbourhood. Stand out works include Tania Ohlsen and Sandile Radebe’s mirrored mosaic of a flock of birds on the corner of the Bannister Hotel building, Thabang Selai’s rainbow-coloured Braamfontein banner on the Grove Square (opposite Galata Bakery) made from recycled plastic bottle tops, Nkosinathi Simelane’s steel cut relief Urban Jungle and a series of murals of famous quotes, poetry and song lyrics about Johannesburg. Throughout 2018 the street-facing exterior walls of the vast Constitution Hill complex, a former prison and now museum and home of the South African Constitutional Court, have been given over to local street artists who have used the space to create murals paying tribute to South African cultural heroes and struggle leaders. Highlights include Nard Star’s mural of South African female activists like Albertina Sisulu, Fatima Meer and Barbara Hogan (all of whom were imprisoned here) and Imraan Christian’s incredible series of five photo-realistic murals that present ordinary and extraordinary scenes inspired by South African people and places (pictured below). 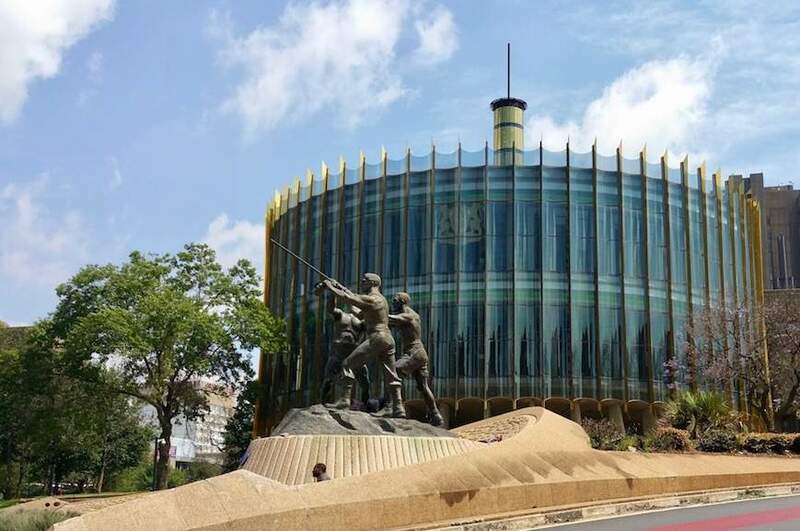 Inside the complex itself, arranged around Constitution Square, there is also a fantastic collection of public artworks to admire, including works by the late great Dumile Feni and Joburg-based sculptors Americo Guambe and Pitika Ntuli. Braamfontein is home to Grayscale Gallery, Joburg’s original graffiti-focused art gallery and one of the main places in the region where graffiti artists come to buy their spray paint cans. Grayscale pioneered the City of Gold urban art festival which every year sees top graffiti artists coming to Joburg to paint large new murals, many of them located in Braamfontein. Local graffiti hotspots where you can find some of the coolest works produced by visiting artists include the alleyway next to Grayscale Gallery at 19 Henri Street and the corner of Eendract Street and De Korte Street (pictured). The facades of the buildings which look onto the Nelson Mandela bridge have also become a regular graffiti canvas with an ever-changing collection of murals covering the lower walls. For street art and graffiti focused walking tours of Braamfontein contact local walking tour operators Jozy Triangel Tours or Past Experiences, both of whom specialise in graffiti and street art tours.